So we’ve got this new book coming out. That’s it there, at the top. 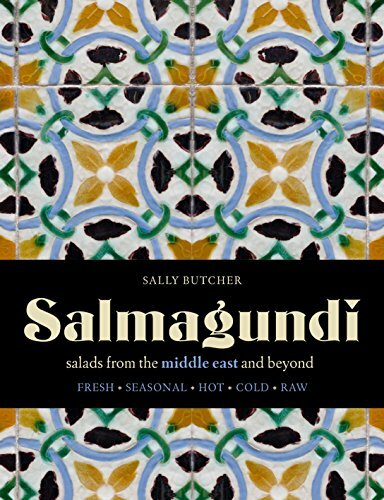 For the uninitiated, the word SALMAGUNDI refers to the medieval practice of emptying the pantry into one big composed salad: this happened most often on a Sunday evening, when servants were traditionally given the night off and lords and ladies of the manor were left to fend for themselves (in a stunning early example of Middle Class Problems, perhaps). Anyway, the new tome is a gallimaufry of the world’s salads, old and new. And there is a load of nice veggie stuff in there, as you might expect. Heat the non EV oil in a saucepan until it is sizzling, and then toss in the harissa spice, stirring constantly. After 30 seconds or so, add the amaranth, again stirring well. Amaranth can easily turn to mush if you just boil it – toasting it thus helps it retain its integrity (shame the human race cannot thus be treated, no?). Cook until the grains begin to brown and pop, and then add around 200ml of boiling water (stand back as it will all hiss like billy-o at this stage). Turn the heat down to simmer and bubble for around five minutes or until the liquid is more or less all absorbed and then add around another 100ml boiling water (yes – it is just like cooking risotto): bubble for another five minutes until this water too has been absorbed. Stir well, turn the heat down as low as it will go (use a heat diffuser if you have such a thing), wrap the lid of the pan in a clean cloth and allow the amaranth to steam for around another ten minutes or until it is cooked and fluffy. Set aside to cool. Tip the grains into a bowl and add the grated and chopped vegetables, red currants and herbs, mixing gently so as not to mash the currants. Mix the harissa paste with the citrus juice, the reserved beetroot juice, flower water and olive oil, and season this dressing to taste. Just before you want to serve, stir the dressing through the salad (grains are thirsty so and sos and drink up the dressing if you pour it on too early). Toast (dry fry) the first three ingredients in a frying pan, stirring constantly: they only need a couple of minutes. Set aside to cool a little. After five minutes or so, toss the toasted spices with all the other ingredients, and then whizz the mixture briefly in a coffee grinder in batches (or pound in a pestle and mortar). You don’t want it to end up totally homogenised and powdered: some texture is desirable. 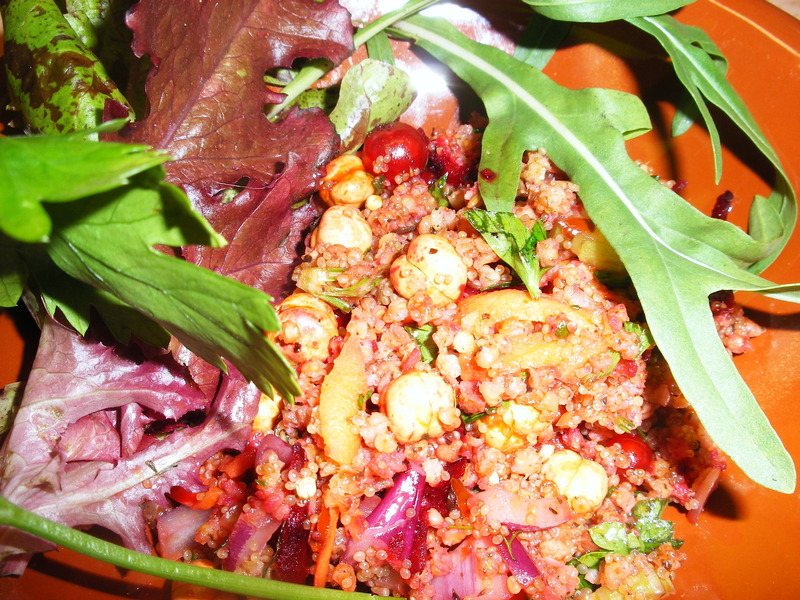 **Amaranth is a trendy-but-ancient super grain. It is about as full of protein as a plant can be, so it is useful stuff for the vegan/veggie. And it is gluten free. And it kind of tastes nice. If you can’t find it, you can substitute (the equally gluten-free) millet. 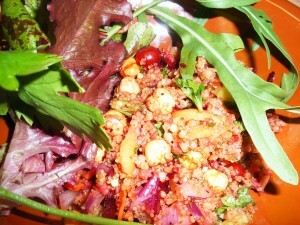 This entry was posted in Recipes and tagged amaranth, harissa paste, harissa spice, Moroccan salad, red currants, super-grains. Bookmark the permalink. Is it likely to be available as an ebook? Thank you! And yes: I am sure it will be out very soon on Kindle etc.